Members of the U.S. military have a long-standing tradition of carrying a special coin symbolizing unit identity and esprit de corps. Known to generations of American military personnel as challenge coins, they are a vital part of military life today and are revered by troops in every branch of service. Challenge coins are now carried by soldiers, sailors, airmen, and Marines, as well as lawmen and firefighters. These coins identify the bearer as a member of a particular unit with a well-defined history and mission. Today the concept of challenge coins is growing to embody groups of many different affiliations. 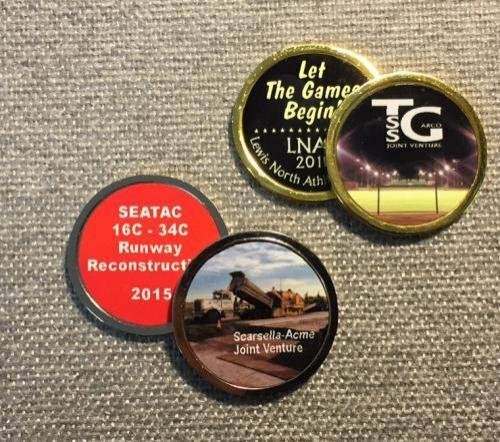 Whether used to commemorate the grand opening of a new facility or to congratulate finishers of a specific race, each of our double-sided coins can be customized with full-color graphics, photos, and/or text specific to the occasion. Each coin is 1.75" in diameter and comes with either a goldtone or silvertone edge finish.